DTP's Shareefa is dubbed as a soul artist, but her soul isn't the soul of Sade or Patti LaBelle. It is much more akin to the soul of Mary J. which, noting that Mary is the Queen of Hip-Hop Soul, is a more modern manifestation which assumes the attitude, style, and lexicon of hip-hop. The way Shareefa screams into the mic is an anger and grit that is completely absent in historical Soul music. This is why we many times fail to understand contemporary music's and, particularly, hip-hop's changing content because we continue to think about it in antiquated forms. "Soul artist" just doesn't do it anymore. 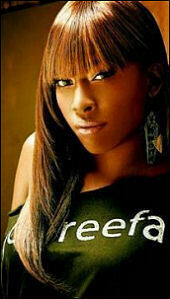 Shareefa is hip-hop, though she sings. Only when we part ways with these archaic categories are we truly in a position to appreciate what hip-hop is, and then begin to see Shareefa and others of her ilk in a category which is adequate to the object we're thinking about. MVRemix: …and that's home to a lot of historical hip-hop artists. MVRemix: How do you feel that that hip-hop, you know, particularly of Newark and East Orange have influenced your music? Shareefa: A lot. I'd say a great deal. Like, coming up, you know, that's who I was listening to. You had a lot of people out that was making moves so it definitely influenced my music and me wanting to be a singer even more. MVRemix: Right now is the time for the South. They are, more or less, the epicenter of hip-hop. Had you found it difficult at all to appeal to the South being that you're from the East? Shareefa: No, not at all, 'cause I feel like my music is universal. You really can't put—it's like some fine wine, you really can't put a tag on it and be like, "She's from here, she's from here" because once people here me talk they automatically know I'm from somewhere up North, you know, but my music is, I feel like its universal. I make music for everybody, not specifically for one type of audience. MVRemix: What pushed to sign with Disturbing Tha Peace, because I had heard that Teddy Riley was wanting to sign you. Shareefa: Yeah, I actually went with Teddy Riley when—he discovered me at sixteen. I worked with him off and on for around three, four years. The situation didn't work out, but I learned a lot from him, so shout out to Teddy Riley. Then two years ago I was working in Charlotte, like, in and out of the studio. I came up with 12 songs and got handed to Jeff Dixon, one of the CEOs of Disturbing The Peace. I met him on 114th in Harlem, sung for him on the block. The next day I went up to TRL and met Shaka and Ludacris and it was on. MVRemix: I heard about that little twist of fate where you had pushed the demo to Jeff Dixon. What do you think you'd be doing if that hadn't happened? Shareefa: Still making music and chillin and probably got a little job that I don't wanna have. Pissed. MVRemix: Well, do you have other interests besides singing? Shareefa: I do. Film, I like acting. I wanna write scripts. MVRemix: So have you done any acting in the past? Shareefa: In school, like here and there, you know, in drama classes, but I love it. Yeah. Ever since I was little [I would pretend to be on] camera acting out parts and stuff like that so I gotta be hot. I wanna do a scary movie too. MVRemix: Now you said you had written most of this album, you do a lot of writing. MVRemix: What was the motivation for "I Need A Boss"? Shareefa: Actually, Rodney Jerkins and LeShaun did. And he called me and he was like, "Listen to this, listen to the beat." The beat was crazy over the phone. I was like, "Oh, my goodness." So, when we got to L.A. we laid it down and we just—it was hands down, that was the one, we was like, "Ok," so when I come I gotta hit it hard, man. Music scene is getting flooded I said, "I gotta come hard." New artist, I gotta make some noise and we did that. MVRemix: The only other single I had heard and I actually, I just listen to it yesterday on your MySpace site, was the "I'll Be Around" joint. Had you written that song? Shareefa: With Ryan who co-wrote. And that was Salaam Remi who produced that. That was on Ludacris presents Disturbing The Peace. MVRemix: Salaam Remi comes with the beats don't he? Shareefa: Oh yeah, he produced Nas and the Fugees. MVRemix: That's gotta be really exciting to work with folks like that. MVRemix: The album is Point of No Return. What does that signify for you? Shareefa: Basically, I'm at the point in my life where I can't move backwards. I gotta move forward. Everybody comes to that point in life where they gotta figure out where they wanna go and they gotta look back at the past and leave it back there and keep it moving. Every day is a brand new day. MVRemix: Are you going to begin touring after the album drops? Shareefa: Actually, I'm touring with Lyfe Jennings the end of this month for a straight month. So I'm very excited. Then after that, hopefully, top of the year, we can do something with Luda. MVRemix: Had you had a chance to meet with Lyfe yet? MVRemix: Are you a fan of his music? MVRemix: So it'll be a good mix? Shareefa: Yes, yes. Very soulful, I think. Female, male, that's gonna be hot. MVRemix: Tell me about relocating to North Carolina. What were the circumstances surrounding that? Shareefa: My mother was getting married and she just wanted a change so you know we were still in school when we left Jersey and I was about fourteen. MVRemix: So it was kind of involuntary then, for you. Shareefa: Yeah, [laughs] I had no say-so over that, whatsoever. It didn't matter if I cried a bag of tears. MVRemix: I heard that you were on 106 & Park a few weeks back. How was the reception? Shareefa: It was beautiful. I love 106 & Park, you so crazy ‘cause I been sitting at home watching 106 & Park forever, like, "watch I'm a be up there, one day," and to actually be up there just like, "wow." MVRemix: Who are you listening to in the car, right now? MVRemix: Well its gotta be kinda cool to be compared to these artists. Shareefa: Yeah, that's big. That's big because these women are like, you know, living legends. That's crazy. MVRemix: Is that kind of intimidating too? Shareefa: No, not at all. Not at all. I'm my own woman. MVRemix: Do you have any projects slated for the future? Shareefa: Right now [Point of No Return] is all I'm focused on, October 24th. MVRemix: Anything you wanna say before we conclude? Shareefa: No, just thank you for the support, everybody, for the support on "I Need A Boss". We got the next single, "Cry No More" for you. Point of No Return. "I'm at the point in my life where I can't move backwards. I gotta move forward. Everybody comes to that point in life where they gotta figure out where they wanna go..."